Husband and wife team Matt and Gill Hanson talk CAT through how a 10-year-old’s dream became a reality in new state-of-the-art facilities. 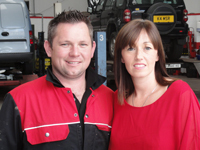 Starting an independent garage is not easy at the best of times, but making the jump from working on your own to employing a team is very much another, as Matt and Gill Hanson will testify. Matt Hanson, Owner of MH Vehicle Services explains: “Only two years ago I was in a unit just down the road. I used to only have one bay, one ramp and had to take my MOTs out. Then, one day, the wife said why don’t we open up an MOT line? “I can get more in these days, and I work on bigger things. I do lorry work up to 7.5-tonnes and bigger vans – I’ve gone from right small to right big,” he says. Never could a phrase be more appropriate. Matt and Gill have both made the transition from a small business to a larger one, while part of his upbringing reveals a backbone of skill. When he was younger he spent a lot of time in the garage where his dad worked, which ignited a passion to be a technician. “From the age of 10 I started racing my Mini, until I was 16, with my brother. We used to fix them all there, while all the other lads had their parents fix them. That was how I was brought up. I always wanted to be a mechanic, and people couldn’t believe what I was doing at a younger age. Since moving into their new premises a couple of years ago, Matt and Gill are facing a whole set of different challenges by expanding the business. Matt says: “From a little independent to something like this? When you are a small company, nobody seemed to bother you, but now we have grown bigger, there is a lot of paperwork just to cover yourself. Gill explains that they have taken on and transformed what was originally a shell into a functioning workshop. It was no easy feat, but now they can begin to look forward. 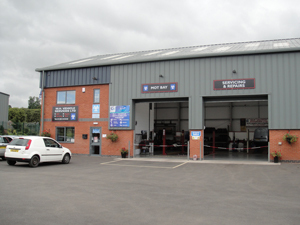 Along with securing more fleet and contract work, they also hope that being registered as an Autocare garage and a member of Approved Garages, with Groupauto and Motor Codes will bring in more customers. Either way, Matt says some customers can prove tricky to deal with: “The worst thing out there is eBay. You get people who ring up asking for a quote and then they tell you they can get the part cheaper than I can supply it for. So I tell them that if they want me to fit the part then I will, but I am not selling any warranty on it. If it fails, you have got to pay me again to take it off. You pays your money and you takes your choice, but if more consumers choose to purchase the cheapest possible parts online, workshops could find themselves having to do a few more crash courses in what quality means.